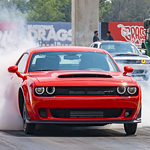 The Dodge Challenger is an impressive car, inside and out. Its aggressive stylings appeal to many, and it has the components it needs to power its way through a variety of conditions. If you want more out of a Dodge Challenger, you can choose from one of the available feature packages that we offer at Arrigo Ft Pierce. The Performance Handling Group comes with quality features. High-performance suspension, performance steering, steering wheel-mounted paddle shifters, a high-speed engine controller, and four-piston Brembo brake calipers are all things that a driving enthusiast can appreciate. Inside, the cabin is luxurious with heated and ventilated Nappa leather seats with Alcantara suede inserts. For those who prefer a classic look, there's the R/T Classic Package. It includes 20" hyper black aluminum wheels, the Challenger script badge, dual side stripes in either red or black, and high-intensity discharge (HID) headlamps.